Facebook is pushing 360-degree VR content on its platform and in April announced its Surround 360 Open Source high-end VR camera. Now the company has posted detailed instructions on GitHub, which appear to be inspired by Ikea furniture assembly manuals, on how to source the parts, assemble the camera and install the software. The Surround 360 combines 17 4MP cameras, 15 of them arranged in a circle and two fish-eye lenses on top and bottom, to capture 4K, 6K, or 8K 360-degree video. The cost of all the parts and components needed to build the device is approximately $30,000. This is a lot more than your average consumer VR camera but compares favorably to similar professional systems. Facebook also says it took a randomly selected engineer 4 hours to build the camera, so once all parts are available it seems you can be up and running in less than a day. 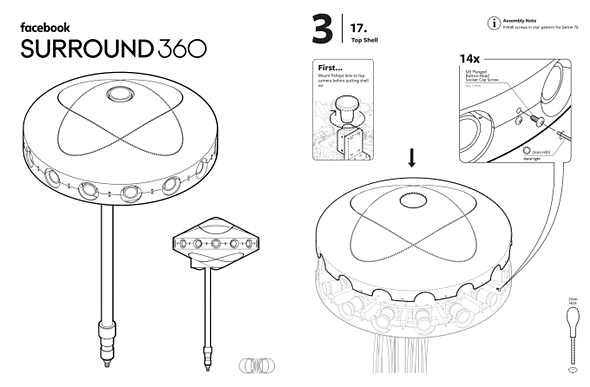 If you like the idea of building a Surround 360 for yourself you can download the instructions and software on GitHub. The video below shows you a time-lapse of the assembly process.